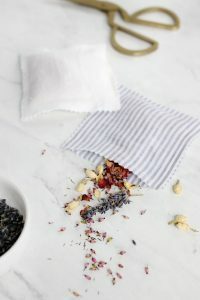 Growing up, my mom and I used to make DIY herbal sachets every fall. We would gather up dried herbs, flower petals and fabric scraps and spend an afternoon sewing sachets just in time for the winter months. We said they were to keep the bugs away, but truthfully, it was just our way of holding on to a bit of summer. 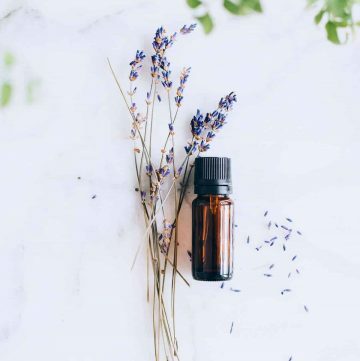 I always made sure to tuck a few in my dresser drawers and underneath my pillow so I could enjoy the scent of rosemary, lavender and lilac all season long. These floral sachets are just like the ones I used to make as a kid, only they require absolutely zero sewing. 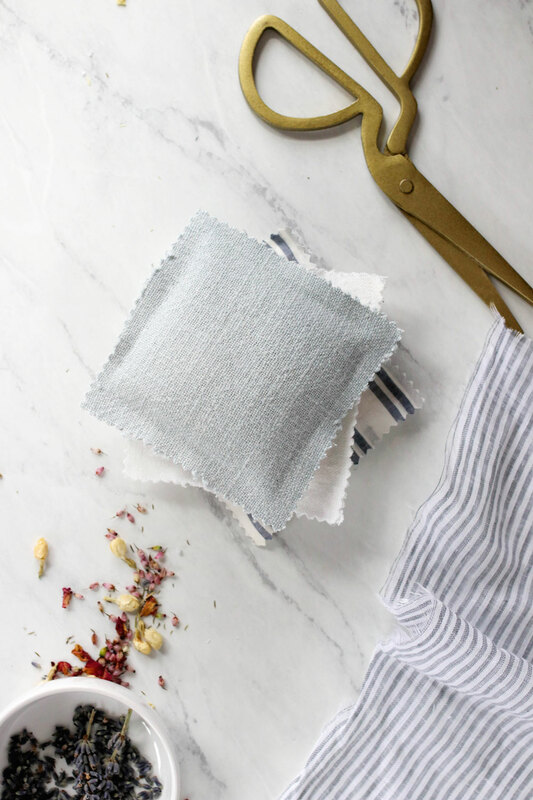 Just round up some fabric scraps, fusible sewing tape and dried flowers, and you can whip them up in 10 minutes tops. Lavender usually comes to mind when I think of sachets, but let’s be honest, that can get boring pretty fast. Instead of limiting yourself to grocery store blooms and herbs, why not use what’s left over from the summer growing season. Toss in a little dried basil or mint. Or save an old bouquet and harvest the dried blossoms. 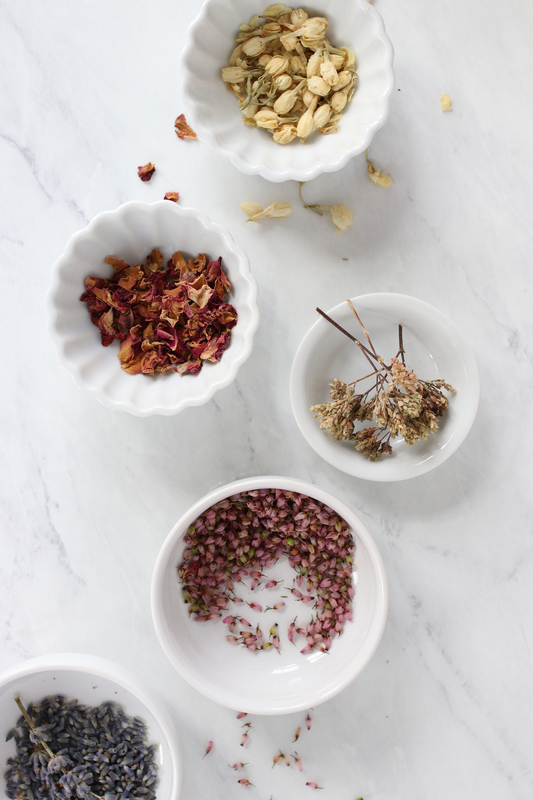 Anything pretty and fragrant should do the trick. 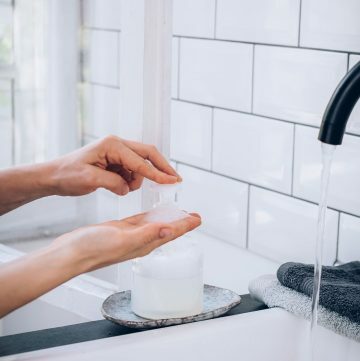 If you just want to infuse your clothes with a pretty scent, herbs are especially good at holding on to their fragrance. The best part about these is that you don’t have to be a seamstress to make them. Either you can buy ready-made mesh bags at the dollar store and fill them with your herbs of choice. 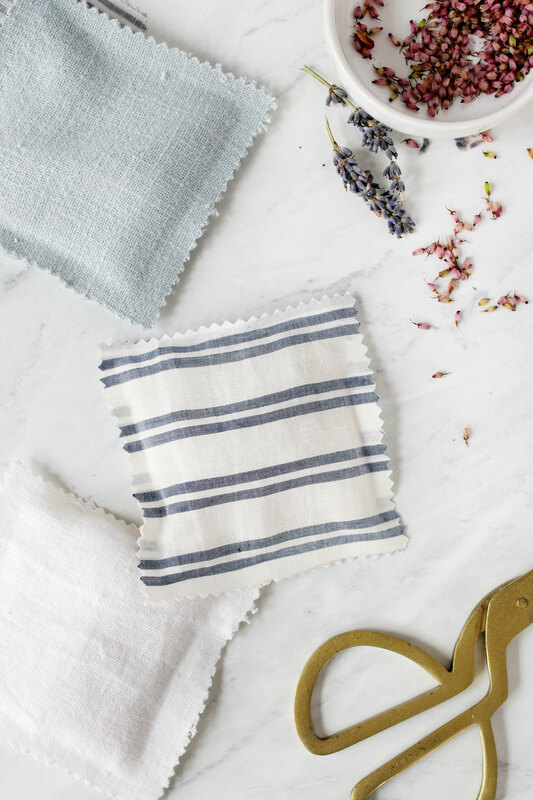 Or use old fabric, fusible sewing tape and an iron to make more traditional no-sew fabric sachets. And if you gather all your materials ahead of time, you can put them together in less than 30 minutes. Oh, I almost forgot: these sachets also double as dryer sheets. Just toss ’em in the dryer on low (high heat might melt the fusible tape used to seal them) along with a load of clean laundry. 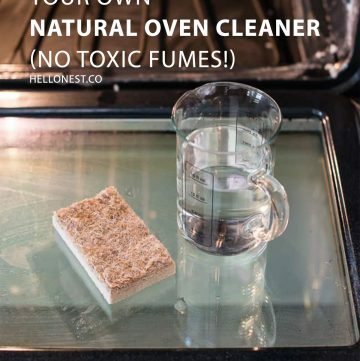 They will make your clothes smell amazingly fresh and clean. Using a pair of pinking shears, cut an even number of squares measuring 5×5″. You will need two squares for each sachet. For each sachet, cut four 5” pieces of fusible bonding tape. 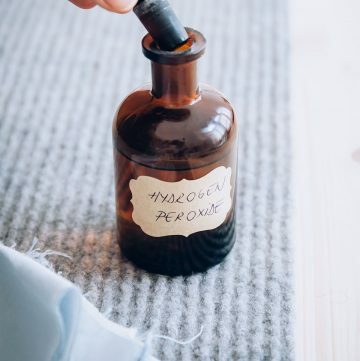 Lay a linen square face down on your ironing board. Lay a piece of bonding web on each edge of the square (four pieces total). Finally, place a second square on top, sandwiching the bonding web in between the two pieces and taking extra care to line up the edges. Iron only 3 sides of the square, leaving one side open so you can stuff it with your herbs and flower petals. 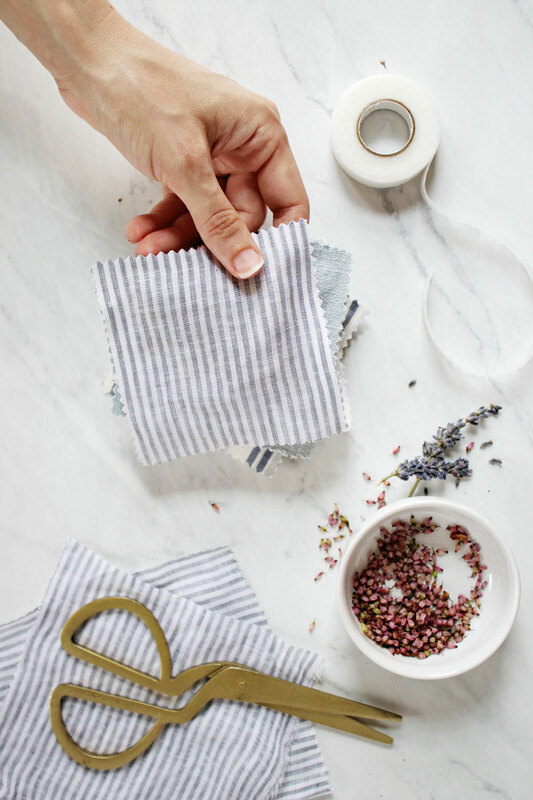 Place a handful of dried herbs inside the linen pouch and iron the top closed. 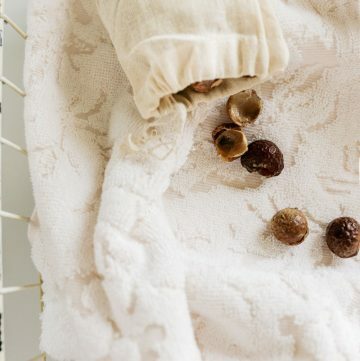 Place sachets in dresser drawers, closets and underneath pillows.